Devil’s Advocate: Give Uncle Sam a Free Loan! I was reading an article from Yes I am Cheap suggesting that people Stop Giving Uncle Sam A Free Loan. She’s writing about popular finance experts’ mantra that you should set your deductions such that you don’t get a big refund at tax time. When you do, it means you could have received a little more each month during the past year. By not taking this money when you could, you are letting Uncle Sam use that money for free. He doesn’t pay any interest on that money… and it is your money. As Sandy points out, it’s far better to be on the side that receives a big refund than having to pay thousands. Having been on both sides, I can say I firmly agree. Some people, such as myself, have such irregular income that it is hard to plan taxes and minimize the loan that I give Uncle Sam. For that reason, I’m err on giving him too much money. The article also quoted that “according to the IRS, of the 48 million tax refunds processed through the end of February, the average tax refund was $3034.” Let’s look at this number in a little more detail. First people getting their money back in February are going to be the ones who are more likely to get a lot of money back… that’s why they getting their tax refunds in early. Right from the start, this number might not be indicative of the overall average refund. Secondly, the average refund is interesting in itself. By nature it only consists of people getting a refund, so it doesn’t count the people who planned well and were off by a few dollars having to give a small payment to Uncle Sam. I’d be curious to know what the average tax payer has to pay or get refunded, so you have both sides to balance it out. If you only count positive numbers, it is more likely to be a high positive number, right? Lastly, how much of a loan are you really giving Uncle Sam. Interest rates at banks are hovering around 1% (if you are lucky), which means it could be as little as $30 in lost interest using $3034 as the average refund. Even if you were expecting a 8% return in the stock market (not that you should “expect” this), you’d still be looking at less than $250. In fact, it could be considerably less since it isn’t like you are getting that $3034 up front, you are getting it throughout the year. You wouldn’t have access to the money at the start to earn that income. 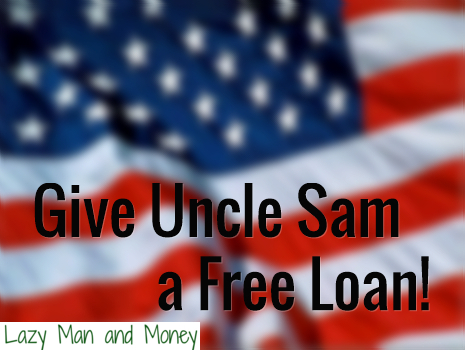 At the end of the day, giving Uncle Sam a free loan may not cost you nearly as much as you think. It probably amounts to somewhere between $30 and $100. I’d rather have the piece of mind that comes with no owing a lot of money. And if your taxes are as complicated and income is as irregular as mine is, it simply isn’t worth stressing over. I personally have no problem with people that refunds. Most people, if they have the money throughout the year, will spend some or all of it. Figure that even if you spend just 10% of it through the year, you’re still coming out way behind versus had you just let Uncle Sam have the interest free loan. On paper, no refund looks like the way to go, but from a practical perspective, it’s not always manageable. That’s a great point about the interest rates being low now, versus what they were in the past. I could see in the past caring a little more about not giving Uncle Sam a free loan. Still even at 7% interest, I don’t think it is that big of a deal.